Abstract: The objective of this research is to examine and present the methods of recognizing, recording and doing the financial report of the surplus raised within the revaluation of the entity's fixed assets. As a starting point, there are presented the stipulations of the National Accounting Standards regarding the subsequent evaluation of fixed assets (NAS "Tangible and intangible assets", NAS "Investment Property", NAS "Impairment of Assets", etc. ), afterwards being examined the provisions of the International Financial Reporting Standards concerning the methods of revaluating the fixed assets, their recognition, book-keeping and financial reporting. Abstract: Double taxation is the levy of tax by two or more jurisdictions on the same declared income asset or financial transaction. Depending on the juridical aspects related to the legislator's will, double taxation can be deliberated or unintentional. It is also based on various criteria of appearance, such as residency criterion, criterion of nationality and source of income. There exist different methods to avoid double taxation at national and international level, by respecting both domestic laws and conventions signed between the involved parties. Abstract: In the Romanian accounting system, the costs incurred for obtaining the products (assimilated here: semi-finished products, finished products, residual products, agricultural products, products in progress) are compensated by registering of certain incomes when they are handed over to the warehouse, and then adjusted registering price differences at the end of the month. Due to this fact and to the more complex function of the account 711 - "Revenues related to product inventory costs", the auditing of finished product accounts, of price differences in finished products accounts and of related revenues (acc. 711), usually present a high degree of risk. Also, the specificity of these accounts requires a good knowledge of the system used to calculate production costs, respectively of correctly identifying the categories of expenses which will be included/not included into the cost of the products. Thus, in the present study, the main objective aims to establish certain working hypotheses, which identify situations related to the inclusion/non-inclusion of the certain expenses in the cost of the products, that will influence the result of the activity (taking into account the present laws) and based on the stated hypotheses to draw the related rules. Abstract: The aim of the present paper is to highlight the environmental policy of Romania over the last five years. It will be shown the level of environmental expenditures, public and private, and we will search evidences of a coherent environmental policy conducted by the Romanian state in the last period. The purpose of this paper is derived from the fact that Romania has, lately, more and more problems related to the environmental protection, problems revealed by the EU through various communiques and warnings addressed to the Romanian Government regarding the management of environmental policy. Therefore the objectives of this paper are: presenting the main theoretical aspects regarding the environment, presenting the Romanian environmental commitments, the analysis and the interpretation of some relevant macroeconomic indicators for the environmental policy. 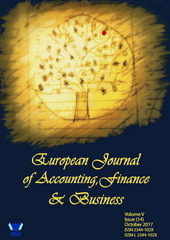 Abstract: There are currently continuous metamorphoses of the accounting system within the public sanitary institutions for self-financing by changing the emphasis from the control function to the communication function, creating new requests for interested parties' information, new accounting objects and evaluation methods of these ones, which has led to integrated reporting. Thus, in order to meet the needs of information users, a new reporting model is needed, which takes into account the relationship between environmental and social factors, the quality of management, reflecting the impact of long-term decisions on the sustainable development of entity and the economy as a whole. The need for complete information on external reporting of Public Health Care Institutions (PHCI), at least at this time, has led to the expansion of traditional financial reporting by including social and environmental aspects within the traditional reporting. This concept (integrated reporting) is a mix between the classical financial reporting and the concept of sustainability (also known as sustainable development). The integrated reporting highlights the relevant information to valuing value from a long-term perspective for decision-makers and encouraging the allocation of financial resources to support long-term value creation in the sense of societal expectations.